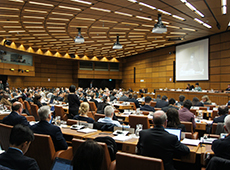 For more than 50 years, the United Nations Office for Outer Space Affairs (UNOOSA) has played an important role in the development of a legal regime for space activities, known as space law; in the spread of new science and technology resulting from space activities; and in the promotion of international cooperation in the space arena. 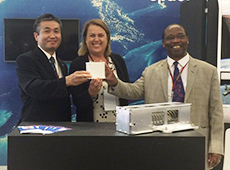 The Japan Aerospace Exploration Agency and UNOOSA have deepened their collaboration by launching KiboCUBE, a joint program that gives educational and research institutions in developing countries the opportunity to gain experience in space technology through the use of the Kibo module on the International Space Station. We spoke with UNOOSA Director Simonetta Di Pippo about her experience of working with JAXA and the importance of international cooperation in the realm of space. — Please tell us about UNOOSA. UNOOSA is the UN body that deals with space science, technology, law and policy. You could say that we are the gateway to outer space in the United Nations system. We promote international cooperation for the peaceful use of space, and are involved in a wide range of activities to spread the benefits of space activities throughout the world. One of our important missions is to provide training in the utilization of remote sensing data from satellites, satellite communications, and satellite positioning technology, and to provide support for developing countries in using space technology for sustainable development. In addition, we maintain the Register of Objects Launched into Outer Space, and serve the Committee on the Peaceful Uses of Outer Space (COPUOS) and its two subcommittees: the Scientific and Technical Subcommittee (STSC) and the Legal Subcommittee (LSC). COPUOS, which is a permanent committee of the United Nations and promotes international cooperation and the creation of rules on the peaceful uses of outer space, currently consists of 84 member states. The STSC usually meets in February and the LSC usually meets in April every year to debate various topics, after which COPUOUS itself meets in June in Vienna. The committee’s final report goes to the General Assembly in the fall, where the annual resolution on international cooperation in the peaceful uses of outer space is adopted. — In recent years, several Japanese have worked with UNOOSA: JAXA Technical Counselor Yasushi Horikawa, who served as Chair of COPUOS; JAXA Space Environment Group Leader Takahiro Obara, who was a Co-Chair of Expert Group C on Space Weather, which was established under the Working Group on the Long-term Sustainability of Outer Space Activities and has subsequently completed its work (currently a professor at Tohoku University); Professor Setzuko Aoki of Keio University, who was Chair of the Legal Subcommittee’s Working Group on International Mechanisms; and JAXA astronaut Takao Doi (currently a specially appointed professor at Kyoto University). 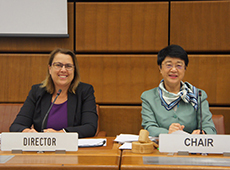 This year, JAXA Technical Counselor Chiaki Mukai is serving as chair of COPUOS STSC. There are more and more opportunities for people to contribute to the promotion of the peaceful uses of outer space. Astronaut Mukai’s term as chair of the STSC began on January 30, and will continue for a year. Her role is very important. In addition to debating things like space debris countermeasures and the use of satellites for disaster monitoring and prevention, she will contribute to preparations for UNISPACE+50, including details of the various priorities already established by the committee. In June 2018, the international community will commemorate the 50th anniversary of the first United Nations Conference on the Exploration and Peaceful Uses of Outer Space, which took place in 1968 in Vienna. On one side, UNISPACE+50 will look at the past – at changes that have occurred surrounding the global use of space, and on the other hand we will consider strategies that will shape future space activities, in terms of how to develop and promote space science and technology for the benefit of humanity. The seven UNISPACE+50 thematic priorities include Global Partnership in Space Exploration and Innovation, and Capacity-Building for the Twenty-First Century. We want to involve more countries and other space actors in the quest to explore the solar system, and we need to look at how to carry out capacity-building for the 21st century. Clearly today’s situation in the space arena is completely different from 60 years ago, when the astronautical era started with Sputnik 1 and Yuri Gagarin. The biggest difference is that, whereas before we were reliant on government support for space development, now there are commercially driven activities, such as private enterprises that are launching satellites into space. Some of our future challenges involve focusing on the impacts of climate change on Earth, and also more and more on disaster management, because this is linked to climate change. I would like to see space technology used for such purposes. And then there are topics relating to space and global health – investigating how we can use space to improve our well-being and quality of life, etc. These discussions will help to shape the global Space2030 agenda. — What exactly do you mean by “Space2030”? The four pillars of the UNISPACE+50 vision are space accessibility, space diplomacy, space economy, and space society. These will form a blueprint for the global Space2030 agenda, which is the long-term strategy for the future activities of UNOOSA and the entire global community. They tie in with other important agendas that were approved by UN member states in 2015. The first of those is the 2030 Agenda for Sustainable Development, approved in September 2015, which is an important framework for eradicating poverty and tackling climate change, and which also encompasses the 17 Sustainable Development Goals. The second agenda is the Climate Change Agreement, approved at the Conference of Parties 21 (COP21) in Paris in December 2015, which aims to achieve greenhouse gas reduction targets. And third is the Sendai Framework for Disaster Risk Reduction 2015–2030, which was adopted in March 2015 at the Third United Nations World Conference on Disaster Risk Reduction. These are the three main agendas that we have to deal with, and all of them have an important milestone in 2030. — Tell us about KiboCUBE. KiboCUBE is an unprecedented joint UN-JAXA initiative. It was started in September 2015, and aims to provide educational and research institutions in developing countries with the opportunity to deploy their own CubeSats from the Japanese Kibo Module on the International Space Station. This means that countries that do not have the ability to launch their own satellites, and which have never been involved in space before, can now participate in space development. We run workshops and training sessions on aspects of spacecraft engineering, such as design and assembly, according to the needs of each country. So it’s a way of building their capacity to go through the entire cycle of a space mission. We received 13 proposals from all over the world for the first round of the KiboCUBE program (September 10, 2015–March 31, 2016), and in August 2016 we selected the satellite from University of Nairobi in Kenya. This is the first time Kenya has a chance to develop a satellite, working with international experts. Students have learned how to do basically everything, from manufacturing the satellite and loading it into the rocket, to all aspects of the launch. Their satellite is scheduled for insertion into orbit from Kibo, and we hope this will help them develop a larger Earth-monitoring satellite in the future. Applications are currently open for the second round of the KiboCUBE program (September 27, 2016–March 31, 2017). We are hoping that many countries will be able to take advantage of this innovative program and become part of the global space family. — What is the significance of KiboCUBE? UNOOSA’s Human Space Technology Initiative (HSTI), which we launched in 2010, was the first attempt to increase the global benefits of space activities and make space exploration a true international effort. The aims of that program are to increase international cooperation, share knowledge, and train personnel, so we hope that KiboCUBE will bear some fruit along those lines. KiboCUBE is really a very good example of how UNOOSA can work with a space agency. One of the features of this program is that the flight of each CubeSat selected is provided free of charge by JAXA. So, for developing countries that do not have a big budget available for such activities, this is highly significant. It also shows Japan’s willingness to support our activities, and its strong commitment to helping developing countries. So it's a great project from all standpoints, and I can not possibly say enough to thank JAXA and the Japanese government for their support, and for what they are doing on behalf of UN member states. — What are your expectations for KiboCUBE? KiboCUBE is the first step in UNOOSA’s mission to create opportunities for developing countries to participate in space development. For us, the deployment of the University of Nairobi’s CubeSat from the ISS will be a key moment in history, and I hope I can visit JAXA soon and witness it with my own eyes. In the first round, we learned a lot about the aspirations of developing countries: their goal, abilities, and willingness to be part of space activities. We hope to put this to good use in the second round. This is part of a more general strategy under the HSTI. In March 2016 I also signed an agreement with the China National Space Administration to allow developing countries access to microgravity conditions on the Chinese Space Station (Tiangong, or “Heavenly Palace”), which is scheduled for completion in 2022. And we’ve also started to work on the first UN space mission with the Sierra Nevada Corporation, to use their Dream Chaser spacecraft to give developing countries the opportunity to develop and fly microgravity payloads for an extended period in orbit. So I hope that our efforts to support developing countries with KiboCUBE will lead to further participation by these and other countries, and that through the peaceful use of outer space we can solve global socioeconomic problems and improve the quality of life on Earth. — Chiaki Mukai was the first female Japanese astronaut, and has been a leader in Japan’s space program for a long time. She is also now the first Japanese and the first woman astronaut to be appointed Chair of COPUOS STSC. Could you talk a little about the achievements of women in the field of space? I’m always thinking about the need for more involvement from women in the realm of space. Peggy Whitson is currently in space for the third time, and she was the first female commander of the ISS. There is a famous picture from 2007 showing her, as commander of the ISS, with Pamela Melroy, who was commander of the space shuttle Discovery on STS-120, marking the first time that both spacecraft had been commanded by women at the same time. So the fact that these two women met in orbit as commanders of their respective spacecraft is quite an achievement, and it has not happened again since then. In my case, when I was appointed Director of Human Space Flight at the European Space Agency in 2008, there had only been two female directors in the history of ESA since its founding in 1975 – myself and a French woman. And this is still the case today. Just as we do not have balanced representation of women and men in key positions in society, we do not have a balance in the field of aerospace. UNOOSA is currently putting together a new program called Space for Women, which will focus on women in STEM (Science, Technology, Engineering and Mathematics), mainly from developing countries. We hope that this will be presented for approval by member states at UNISPACE+50. I have to say that Dr. Mukai is a great role model because not only is she a medical doctor, she is an astronaut, and, as you mentioned, she was the first Japanese woman in space. We need more women in the space sector and in leadership positions, and I hope that the Space for Women project, with the support of Dr. Mukai and others, can help to fix this gender imbalance. — What are your goals and expectations for future cooperation with JAXA? Overall in the past, cooperation with the government of Japan has always been very, very good, but this is the first time that we have entered into formal cooperation with JAXA, and the results have been outstanding. I am sure we can build on it and work toward the next logical step. Speaking of which, Japan will be hosting the next International Space Exploration Forum (ISEF) in 2018, which will discuss how to proceed with human exploration of space. This will actually be quite important in terms of bringing together all of the main stakeholders and top level countries in this field, and should really help in the process of defining the agenda for UNISPACE+50 in June 2018, as one of the UNISPACE+50 thematic priorities is Global Partnership in Space Exploration and Innovation. So from that perspective, I expect we will be dealing with the Japanese government and JAXA more and more, especially if our partnership extends into the realm of space exploration. As I already mentioned, our aim is to promote international cooperation on the peaceful use of space, and in order to achieve that, the cooperation and assistance of JAXA and the space agencies of other countries is absolutely vital. After graduating with a Masters degree in Astrophysics and Space Physics from the Sapienza University of Rome, Italy in 1984, Ms. Di Pippo joined the Italian Space Agency (ASI) in 1986. Her responsibilities ranged from Earth observation to automation and robotics, science, and human spaceflight. In 2002 she assumed the role of Director of ASI’s Observation of the Universe. 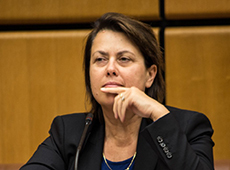 From 2008 to 2011, Ms. Di Pippo served as Director of Human Spaceflight at the European Space Agency, before returning to ASI to lead the European Space Policy Observatory at ASI-Brussels until March 2014, at which time she joined the UN Office for Outer Space Affairs. Ms. Di Pippo is Honorary President of Women in Aerospace Europe (WIA-E), which she co-founded in 2009. She has also been an academician of the International Academy of Astronautics (IAA) since 2013, serving on the Board of Trustees of the Academy since 2015. In 2008, the International Astronomical Union named asteroid 21887 “Dipippo” in honour of her contribution to space activities.